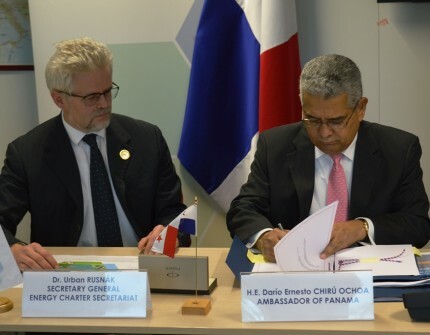 On 26 October 2017, H. E. Darío Ernesto Chirú Ochoa, Ambassador of Panama to the Kingdom of Belgium, the Grand Duchy of Luxembourg and Mission to the European Union signed the 2015 International Energy Charter at the Secretariat in the presence of the Secretary General Urban Rusnák and the counselor of the Embassy of Turkmenistan to the Kingdom of Belgium, representing the country holding the Energy Charter Chairmanship. The International Energy Charter is an expression of long-term political commitment to promote and protect investment in the energy sector. It supports the National Energy Plan 2015-2050 approved by the Government of the Republic of Panama in 2016. Due to its rapid expanding economy, energy demand in Panama is forecasted to grow by 5.2% per annum between 2014 and 2050. The country is open for external investment to meet this additional demand. Panama is the fourth country from Latin America having signed the International Energy Charter; the other three countries are Chile, Colombia and Guatemala. To date there are 87 signatories from all continents that have endorsed common principles for a level playing field in the energy sector. Secretary General Urban Rusnák has invited Ambassador Chirú Ochoa to consider the secondment program focused on investment climate, legal compliance and energy efficiency in the context of future accession to the Energy Charter Treaty. Ambassador Chirú Ochoa welcomed the invitation and expressed willingness to move in that direction.